Ellicott Development has a new current project underway and depending on how you look at it, it could be considered three new current projects. EDC will be developing three new buildings on a 4.1 acre site along Onondaga, Eighth, and Center Streets in Lewiston. The buildings will all be two stories but other than that, they will be unique. Building one will hold space on the first floor for a proposed restaurant. There will be room for this restaurant to have a drive thru and upper patio and the total square footage for this restaurant will be approximately 2,350 GSF. Two other retail spaces will be available on the first floor of building one and will be approximately 1,120 and 2,250 GSF. The second floor of building one will be dedicated to commercial space and is set to be 6,000 GSF. This building will have ample parking with 54 parking spaces available. Building two will have two different types of rental space available upon completion. The first floor of this building will be exclusively for retail. This space will be approximately 5,400 GSF and similarly, the second floor will also have 5,400 GSF. However, the second floor will be used for restaurant space. Restaurant goers and shoppers will have 27 parking spaces available once these establishments are open for business. Finally, Building three will be the biggest of the new builds on Center Street. With a total of approximately 14,964 GSF available once it is completed. 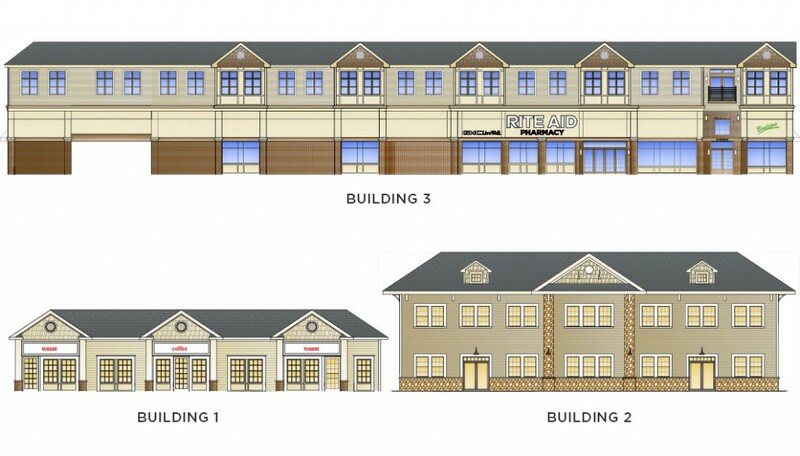 The first floor will hold the majority of the square feet with 11,180, however 3,784 GFS is currently reserved for a propose tenant, Rite Aid Pharmacy. The second floor of building three will feature a total of 13 two bedroom apartments. 108 parking spaces will be available for both residents of the apartments and commercial tenants.